Brian Michael McCann (born February 20, 1984) is an American professional baseball catcher for the Houston Astros of Major League Baseball (MLB). He played for the Atlanta Braves from 2005 to 2013 and New York Yankees from 2014 to 2016. McCann is a seven-time All-Star and a six-time Silver Slugger Award winner. McCann attended Duluth High School in Duluth, Georgia. The Atlanta Braves selected him in the second round of the 2002 Major League Baseball draft. 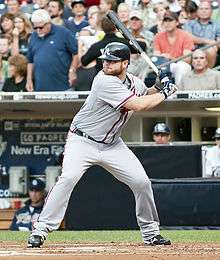 McCann made his Major League Baseball debut with the Braves on June 10, 2005 after playing in the minor leagues for the Rome Braves. A personal catcher for John Smoltz for most of the 2005 season, McCann hit his first home run in just his second regular-season game and became the first Braves player in franchise history to hit a home run in his first playoff at-bat on October 6, 2005. He accomplished the feat in the second inning of a 7–1 victory over Roger Clemens and the Houston Astros in Game 2 of the 2005 National League Division Series. McCann was named the everyday starter when the Braves traded Johnny Estrada to the Diamondbacks. During the 2006 season, McCann hit .333 with 24 homers and 94 RBI. He led all Major League catchers in homers, and his RBI total was matched only by Jorge Posada and Victor Martinez. The Braves rewarded McCann by buying out his arbitration years with a 6-year, $27.8 million contract during spring training in 2007. McCann was selected to play in the 2006 MLB All-Star Game, in his first full major league season, and then again in both 2007 and 2008, making him the first Braves player ever to be selected to the National League All-Star team in each of his first three seasons. In 2008, he allowed more stolen bases than any other NL catcher, with 93. Beginning in April 2009, McCann was bothered by blurry vision in his left eye, due to a slight vision change following 2007 LASIK surgery. He decided to opt for glasses when contact lenses proved uncomfortable. In May 2009, Oakley, Inc. made special glasses for McCann to correct the vision problem and allow for comfort under the catcher's mask. McCann remarked, "I need my Oakleys. I have to have the wraparounds for my peripheral vision." In 2009, he had more errors at catcher than any other major leaguer, with 12, and had the lowest fielding percentage among them (.988). McCann was again selected for the All-Star Game in 2009 and 2010. In the latter, he was named the MVP after driving in all three of the National League's runs with a bases-clearing double in the seventh inning (driving in Scott Rolen, Matt Holliday, and Marlon Byrd), off of Chicago White Sox reliever Matt Thornton, giving the NL a 3–1 victory, its first in the midsummer classic since 1996. On August 23, McCann hit the first walk-off home run reviewed by instant replay. McCann hit a line drive to right field. The ball struck the top of the right field wall. The umpires called it a double, but McCann and Braves bench coach Chino Cadahia argued the call. The umpires went to go review instant replay. Replays showed that the ball struck the top of the right field wall, bounced into the stands, and then got onto the field. Thus, the umpires overturned the call and called it a walk-off home run. In 2010, he allowed more stolen bases than any other NL catcher, with 84. During spring training, on March 9, 2011, McCann hit a line drive foul ball which struck minor league manager Luis Salazar, blinding him in the left eye. On May 17, 2011, McCann hit a ninth-inning, game-tying, pinch-hit home run and an 11th-inning game-winning two-run home run to defeat the Houston Astros 3–1. Also in 2011, he allowed 104 stolen bases, more than any other major league catcher. On July 27, 2012, he became the first player since Jim Thome in 2007 to homer in six straight games versus an opponent. He did this on the same day Chipper Jones tied Pete Rose's record for extra base hits by a switch hitter. On July 14, 2013, McCann was chosen by National League manager Bruce Bochy to replace injured Braves first baseman Freddie Freeman in the 2013 All-Star Game. On November 23, 2013, McCann agreed to a five-year, $85 million contract with the New York Yankees, with a vesting option for a sixth year. The Yankees officially announced the deal on December 3. McCann wore the number 34 as number 16 is retired in honor of Whitey Ford. 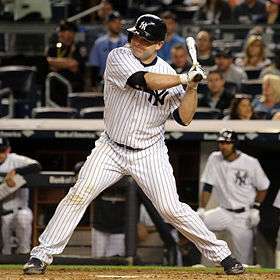 On May 28, 2014, with limited options at first base, manager Joe Girardi slotted McCann into his first career start at first against the St. Louis Cardinals, going 2-for-4 with an RBI, a run scored, and a walk in a 7–4 Yankee win. On September 28, 2014, McCann entered the game against the Boston Red Sox as a pinch runner for Derek Jeter, after Jeter's final career hit. McCann led the Yankees in home runs (23) and RBI (75). On September 6, 2015, McCann hit his career-high 25th home run of the season, a game-tying three-run shot off of Chris Archer of the Tampa Bay Rays. McCann ended the season with 26 home runs and a career-high 96 RBI. On November 12, 2015, he earned his sixth Silver Slugger Award at catcher (his first in the American League). McCann struggled early on during the 2016 season. After the Yankees released Alex Rodriguez, rookie catcher Gary Sánchez was brought up to share in catching duties. After Sánchez had a big impact both on offense and defense, McCann became the primary designated hitter for the team. In 130 games, McCann batted .242 with 20 home runs and 58 RBI, the ninth season in a row in which McCann hit at least 20 home runs. On November 17, 2016, McCann was traded from the Yankees to the Houston Astros for Albert Abreu and Jorge Guzmán. McCann was selected by Team USA in the 2009 World Baseball Classic. Brian McCann's father, Howie, coached at Marshall University and currently runs Windward Baseball Academy. His older brother, Brad, played in the minor league systems of the Florida Marlins and Kansas City Royals before retiring after the 2007 season. McCann married Ashley Jarusinski in December 2007. Their first child, Colt Michael, was born in July 2012. Their second child, a daughter who was named Colbie, was born in September 2013. He resides in Suwanee, Georgia. In 2008, McCann released a charity wine (The McCann Merlot) with 100% of his proceeds supporting the Rally Foundation for Childhood Cancer Research, an organization dedicated to raising funds to support pediatric cancer research and treatments. McCann also has baseball clinics for kids aged 5–18. ↑ Curtright, Guy (October 30, 2009). "Duluth honors McCann, Green". Retrieved November 17, 2016. 1 2 3 "Brian McCann Statistics and History". Baseball-Reference.com. Retrieved November 3, 2011. 1 2 Bowman, Mark (March 22, 2007). "McCann's the man for Braves". MLB.com. Retrieved March 7, 2009. ↑ Mark Bowman (January 1, 2011). "McCann to play at Triple-A on Thursday | MLB.com: News". Mlb.mlb.com. Retrieved November 3, 2011. ↑ ""MLB Player Fielding Stats – As c – 2009", ''ESPN'', accessed October 6, 2009". Espn.go.com. Retrieved November 3, 2011. ↑ "McCann's three-run double gives NL first All-Star win since 1996". ESPN. July 13, 2010. Retrieved July 14, 2010. ↑ Kepner, Tyler (July 13, 2010). "National League Ends All-Star Loss Streak". New York Times. Retrieved July 14, 2010. ↑ David O'Brien (May 18, 2011). "McCann credits older brother's hitting tip | Atlanta Braves". Blogs.ajc.com. Retrieved November 3, 2011. ↑ "2011 Major League Baseball Fielding Leaders". Baseball-Reference.com. Retrieved November 3, 2011. ↑ Simon, Andrew (November 23, 2013). "McCann, Yanks reportedly agree to five-year deal". MLB.com. Retrieved November 23, 2013. ↑ "Yankees announce Brian McCann signing". December 3, 2013. Retrieved November 17, 2016. ↑ "Yankees trade catcher Brian McCann to Houston Astros for 2 pitchers". Retrieved November 17, 2016. ↑ "On paternity leave, McCann a first-time father". Atlanta.braves.mlb.com. Retrieved November 23, 2013. ↑ "Braves resting some regulars". www.ajc.com. September 22, 2013. Retrieved November 23, 2013. Wikimedia Commons has media related to Brian McCann (baseball).